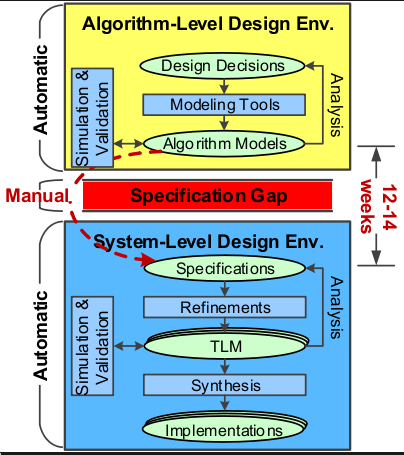 System-Level Design Environments (SLDEs) are often utilized for tackling the design complexity of modern embedded systems. SLDEs typically start with a specification capturing core algorithms. Algorithm development itself largely occurs in Algorithm Design Environments (ADE) with little or no hardware concern. Currently, algorithm and system design environments are disjoint; system level specifications are manually implemented which leads to the specification gap. In this research, we bridge algorithm and system design environments creating a unified design flow facilitating algorithm and system co-design. It enables algorithm realizations over heterogeneous platforms, while still tuning the algorithm according to platform needs. Our design flow starts with algorithm design in Simulink, out of which a System Level Design Language (SLDL)-based specification is synthesized. This specification then is used for design space exploration across heterogeneous target platforms and abstraction levels, and, after identifying a suitable platform, synthesized to HW/SW implementations. It realizes a unified development cycle across algorithm modeling and system-level design with quick responses to design decisions on algorithm-, specification- and system exploration level. It empowers the designer to combine analysis results across environments, apply cross layer optimizations, which will yield an overall optimized design through rapid design iterations. synthesize SLDL out of Simulink for heterogeneous multi-core exploration. Zhang J, Tang S, Schirner G. Reducing Dynamic Dispatch Overhead (DDO) of SLDL-Synthesized Embedded Software. In: Asia and South Pacific Design Automation Conference (ASPDAC). Chiba/Tokyo, Japan; 2015. Zhang J, Schirner G. Towards Closing the Specification Gap by Integrating Algorithm-Level and System-Level Design. Springer Design Automation for Embedded Systems (DAEM). 2015. Zhang J, Schirner G. Automatic Specification Granularity Tuning for Design Space Exploration. In: Proceedings of the ACM/IEEE Conference on Design, Automation & Test in Europe (DATE). Dresden, Germany; 2014. Zhang J, Schirner G. Joint Algorithm Developing and System-Level Design: Case Study on Video Encoding. In: International Embedded Systems Symposium (IESS). Paderborn, Germany ; 2013.